Mid Sussex will be one of 11 areas across the country to take part in a voter ID pilot at next year’s council elections. The Government says these will provide further insight into how the security of the voting process is ensured and the risk of voter fraud is reduced. It is also hoped the pilots will show what methods of ID work best for voters. The Cabinet Office facilitated pilots in five local authorities as part of the 2018 local elections, and according to the Government the evaluation showed that the trials were a success, with the overwhelming majority of people able to cast their vote without a problem. To verify that voters are who they say they are, each local authority will test one of four models of Voter ID checks in their pilot. These are photo ID, photo and non-photo ID, traditional poll cards, and poll cards with scannable barcodes. At the May 2019 elections Mid Sussex voters will be asked to test using poll cards as a means of identification as well as Watford and North West Leicestershire. Anyone who does not have their poll card with them on polling day will be asked to present another form of photo ID including a UK or EU photo-card driving licence (full or provisional) or a valid British, European or Commonwealth passport. According to the Government Northern Ireland has required paper ID to vote since 1985 and photo ID since 2003, without adverse effect on turnout or participation. Chloe Smith, minister for the constitution, said: “I am pleased to see Mid Sussex District Council is taking part in the 2019 pilots. “Their participation will help us gain a deeper understanding of how voter ID will work on a wider scale ahead of a national rollout, and see what works best for voters. “We want people to have confidence that our elections are safeguarded against any threat or perception of electoral fraud. Craig Westwood, director of communications and research for the Electoral Commission, said: “Our key recommendation following the 2018 voter ID pilots was that any future pilots should include a wider range of local councils, taking in a mixture of rural and large urban areas and areas with different demographic profiles. “We are pleased to see this reflected in the proposed list of authorities for 2019, to provide more detailed evidence about the impact of voter identification on different groups of people. “The Electoral Commission is responsible for carrying out an independent evaluation of the Cabinet Office’s pilot schemes. Mid Sussex District Councils are held every four years with all 54 members up for election next May. Back in 2015 when the council election was held on the same day as the general election the Conservatives took all 54 seats. 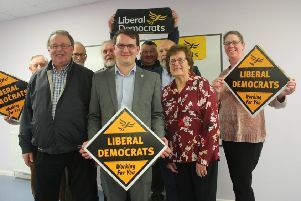 However since then a number of by-elections have been held with Lib Dem Sue Hatton, who represents Hassocks, being the sole opposition member.